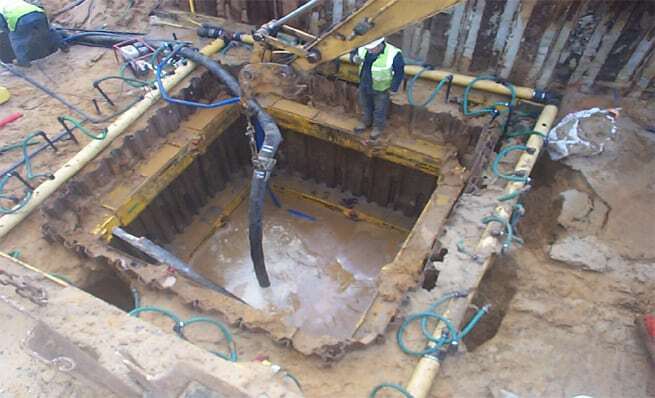 The process of removing water from an excavation is known as dewatering. In this process, the water is drained outside by pumping from the location. The main purpose of dewatering is to provide a dry base for the foundation by lowering the ground water table of a given location. Dewatering is an useful method for dealing with running sand, construction as well as repairing of dams, sewers, basement, building, tunnel etc. 3. Open sump pumping and. 1. The water should not be pumped directly into slopes. 2. Wooded buffer should be used in dewatering, if possible. 3. Dewatering should be done under special supervision, if any signs of erosion or instability found, stop dewatering instantly. 4. Channels to be used on dewatering must be stable and protected with grass or vegetation. 5. Always avoid dewatering under heavy rains. 6. Water contaminated with oil, grease, chemical products should not be discharged directly. In such cases, an oil/water separator can be used. 7. Check and understand the water table condition of the location, because the underground water may be situated near the surface so the plan might not work. So if you liked this article please share it with your friends.